As soon as details are confirmed (national and otherwise), this invitation will be officially sent out to the honourable Diva's Launch invitees and performers. For a while there, Soca Warriors took centre stage on the blog. 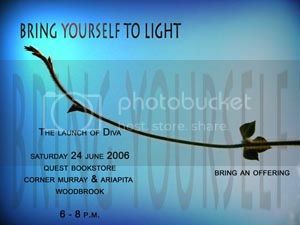 Meanwhile, behind the scenes, the Launch of Diva was being quietly planned, invitees confirmed and performers secured. It promises to be an enchanting (and enchanted) evening which we all are excited about being a part of ... but, in light of recent 'developments', I am wondering if the Soca Warriors will be returning to TT that day! If so, God alone knows what will take place on the streets of this country. Or, maybe Patrick M alone knows, since he announced on TV last night that there will be "celebrations the likes of which this country has never seen before" ... and that it would be forward of him to divluge anything further at this point. I have a feeling she will choose (d) .